Unrivalled access to spectacular views and features. 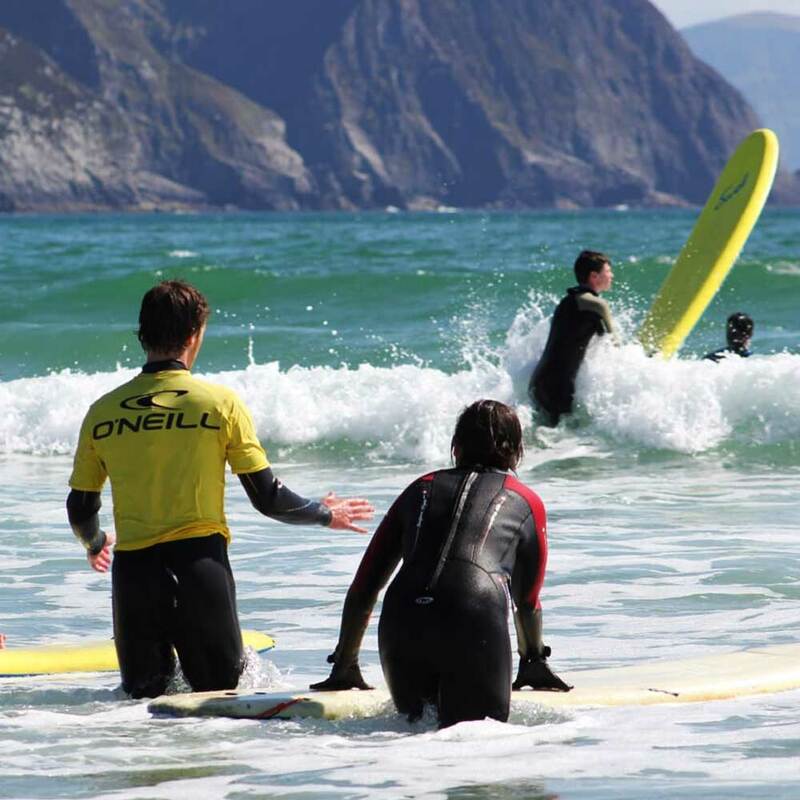 Achill surf does it all. We also have our own fleet of buses to get you round.All of our courses and activities are designed around your needs. With a broad choice of adventures. There are cultural, geographic and historical elements to choose from. We are proud to say we offer unrivaled flexibility. We have designed Adventure courses and tours to suit everyone’s requirements. All of our activities are designed to further participants knowledge. To develop skills while having great fun. Our ethos is ‘Adventure in a safe natural environment’. In relation to school tours, we offer comprehensive outdoor educational opportunities. These are aimed at Primary and Secondary schools. We provide many diverse activities and facilities. Cycling, climbing, summer camps, coasteering, sea kayaking, kayaking and surfing. As well as the opportunity to enjoy and experience new activities our staff team understand the personal and social educational learning opportunities that can be gained through the outdoors. We have what you are looking for in an adventure centre. Diversity, 20 plus out door activities and shuttle bus service to get you there. Booking is straight forward for whatever adventure activity you want to experience. Simply click on the book now pay later button at the end of this page. All our programmes are genuinely tailored to each school booking with us and this is one of the real benefits of our Centre. This does mean that due to different lengths of stays, time of year, group size etc to obtain a definite price for your group it is best to give Jim a call on 086 8047043. When we know your requirements we will be able to give you the quote straight away. Which Weeks and weekends are available? The availability for weeks and weekends changes on a daily basis. To find out which dates are still available give us a call and we can give you this information straight away. Pre booking is essential as our school season & summer activities fill up in advance! 1. Call 085 1554376 to check if the dates you are looking for are available. We can confirm availability & cost at this stage. 6. The Centre Manager will contact you well before your arrival to ensure you are happy with everything and to discuss any questions you still may have. Will there be another group at the centre? Do we have to pay for teachers/Leaders? Is all the equipment provided and what should we bring? All specialist equipment including wetsuits, buoyancy aids and helmets etc are provided. Participants just need to bring their personal kit for a week away. We send a kit list to the school to help children and parents to know what to pack. Can we do activities with you without staying there? We are located on Achill Island. Went here with a small group of friends! Amazing instructors and an amazing day!! We were blessed with the weather and had a fantastic day! Would recommend this place to anyone, whether it be a small or a big group!! Thanks again for the amazing 'surf-ice'😋 We will be back soon!! Our shuttle bus service will get you their to adventures and outdoor activities await you.